Importance of Retail Communication | 8x8, Inc.
We're living in a golden age of choice for consumers. These days, the economy is booming, paychecks are growing, and most retailers have successfully made the transition to the digital economy. Almost everyone is offering so-called "bricks and clicks" — first-class retail locations and superior online shopping sites that helps to reinforce the brand. With that omnichannel excellence in retail comes stiff competition. As a result, retail communication has never been more important. Retailers today require communication systems that are efficient, seamless and invisible in order to attract and retain consumers who are spoiled for choice. Cloud-based VoIP solutions should provide retailers, from single locations and growing franchises to national and international chains, with a single, consistent communication platform across in-store, office and contact center locations. In a recent study, 8x8 noted that "omnichannel, or seamless multichannel communication, has been proven to provide a better brand experience and that has a direct impact on customer retention. The fact is, companies with strong omnichannel customer engagement strategies achieve 89 percent retention versus 33 percent for those with weak strategies." Improving the customer experience is the goal and should be the driving force behind implementing a cloud-based VOIP system that works for you. Removing internal barriers within a business: Now you can bring multiple communication methods together in one system. That means no more finger pointing and on-the-fly troubleshooting when mistakes are made. Ultimately, better communication means increased efficiency with lowered costs. Allowing access to internal knowledge: Using intelligent routing, a customer's call can be directed to an agent with specialized knowledge of the issue the customer is facing. That agent is supplied with personalized details automatically, allowing them to resolve customer issues more quickly and save time per call. Creating quicker response times: The last thing consumers want is to spend more time than necessary on the phone. Indeed, with speed of the essence, system analytics can track the speed and performance of each agent, thereby pinpointing any issues in real time, so retailers can provide retraining or reinforce best practices as needed. 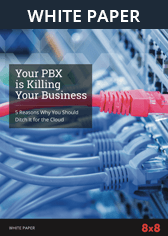 Using a company like 8x8 to provide VOIP is not only a great choice for customer service and overall effectiveness, but it also makes sense from a cost perspective. By reducing the cost of installation and on-site troubleshooting, operational costs were reduced significantly. Retailers also have a new level of flexibility and can scale up or down quickly, depending on the business environment in which they work. A unified communication system is also great news for IT departments. That's because having a well-staffed, cloud-based call center means agents are freed up from installing and maintaining complex phone systems in diverse retail locations. Instead, they can focus their attention and energy on higher value priorities. Furthermore, they're no longer responsible for implementing updates; as a cloud-based system, those updates will occur automatically. Embracing cloud technology doesn't just improve reliability — it also provides a window into operations through sophisticated analytics that can tell a story's business with regard to where things are working, where there are problems and who's doing what at any given time. With those types of analytic insights, you can streamline the customer journey and boost business growth in sustainable ways. Truly unified communication simplifies usage, cuts costs, and improves efficiency. There's no hardware to contend with, no ongoing maintenance, no updates and no need for on-site IT support staff. But there are built-in analytics capabilities that inform higher-level decision-making — critical to those looking to optimize their business in the changing retail landscape. Choosing the right technology is crucial to a successful retail business. Establish a streamlined retail communications strategy today with 8x8, and focus on growing your business. Call 1-866-879-8647 or fill out our online form to request a no-obligation quote from an 8x8 product specialist.